One of the things I’ll often say to folks about visiting Northern Ireland is just how accessible our wonderful landscape is. You can be standing on the rugged north Atlantic coast, backed by proud basaltic cliffs while looking out over a raging ocean. And a mere two hours later, you can have driven far enough south to be standing on the expansive sandy beach at Murlough, looking up at the imposing outline of the rolling summits of the mountains of Mourne. And, for many of these locations, you can park pretty much straight beside them. Having said, there are plenty of places to be discovered, still very accessible, but that are just a bit off the beaten track. Places that require you to invest just a little bit of time and expend just a wee bit of energy in order to enjoy the rewards that await. Anyone can drive to Murlough beach and look up at the Mournes; but only those prepared don a pair of hiking boots and walk for a bit will reach the Mourne Wall and truly see the majesty that the heart of the Kingdom of Mourne has to offer. Anyone can get a train into the centre of Belfast and look up at the hills that seem to cradle the city; but only those prepared to take a quick walk up to the top of Cavehill will enjoy the unique experience of looking down on that self-same city from on high. Recently, I was reminded of a north coast location that falls into that ‘put a wee bit of effort in’ category when I was invited to have a sneak peak of the latest guided tour on offer at the Causeway Coast. The vast majority of the folks from all over the world that visit the Causeway go to the main part of the Causeway itself. And of course they should. 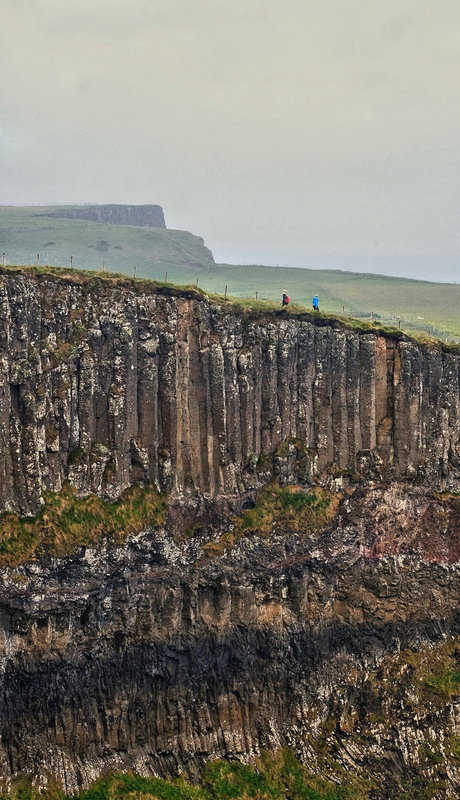 One of the best, most extensive and readily accessible outcrops of basaltic columns in the world, for those visiting this landscape for the first time, this is definitely what they should see. To experience these stones on a day when an Atlantic storm is tossing wave after waves against the resilient columns is truly breadth-taking. Or to sit on the stones late into a summer’s evening, feeling the last warmth of the sun caress your cheek as you enjoy a moment of tranquil bliss as the last moments of the day gently slip away. These are experiences you certainly want to enjoy if you possibly can. But the main Causeway is only a small part of the volcanic coastline just waiting to be explored. It marks the start of the basaltic columns, but bay after bay, for mile after mile to the east contains many more columns, embedded into the cliff face, each with its own charm and beauty. I’ve been along the cliff top walk before, but I was thrilled to be invited to trial out the new guided tour on offer there by the National Trust in collaboration with Away A Wee Walk. The afternoon started with some pre-tour sustenance in the form of coffee and sandwiches in the beautiful Causeway Hotel, where I got to meet various folks with whom I had only interacted before on social media (including Sarah from Walk NI and blogger Lyndsay Malone. The company and craic were great as we headed from the hotel to catch the bus to Dunseverick. From there, it’s a five mile walk back to the Causeway along the most amazing of cliff top locations, the envy of anywhere in Ireland, in my humble opinion! As we walked along the undulating pathway, our wonderful tour guide, Eimear , was full of stories helping us appreciate and understand more of what was around us. We started from the ruins of Dunseverick Castle, and passed by the isolated little bothy in Port Moon Bay (overnight resting place for kayakers travelling around the Causeway coastline). There were plenty of places to photograph on the way up, but it was when we came to Hamilton’s Seat that the glory of this coastline really came into its own. For it’s from here on that those unmistakable columns first make their appearance, sitting proud of the rest of the cliff face, rising majestically for dozens of feet from the base of the cliff to its top. Through in various sea stacks, sweeping bays and the sculpted headlands and this is surely a coastal landscape that could hold its own against any that Ireland has to offer – including (dare I say it!) the Cliffs of Moher?!? From here on round, it’s spectacular bay after spectacular bay, with sweeping arcs of towering basaltic columns adorning the cliff sides, complete with story after story of the history (human and natural) of this coastline. Eventually, the main Causeway came into sight, and we descended the many steps from the cliff top down into the bay and finished off standing on the stones themselves, a good 4 hours after we first left for Dunseverick in the first place. The next time I am bringing first time visitors to the Causeway, this is the route I want to take them along. As you head east to west, the landscape becomes ever more stunning, with the geologic features increasingly impressive, until the final big reveal of the main Causeway at the end. Yes, it’s a five mile hike. Yes, the landscape undulates quite a bit in places, with steps that seem to have been made by someone with one leg noticeably shorter than the other one. Yes, it’s going to require a bit more effort than simply getting the bus from the visitors centre to the stones. But that’s part of the charm, the reward that awaits those who are prepared to put that wee bit of effort in. Go on – you know you want to! 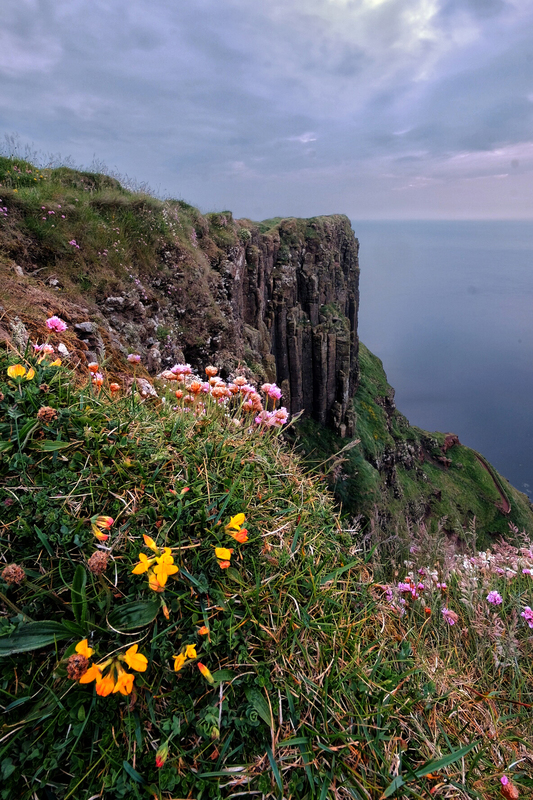 Access to the cliff top path is entirely free and open for anyone to enjoy. However, should you want to enjoy Eimear's company and find out much more about the history and setting of the coastline, you can find out more about the guided tour here.